I met Diane Keaton today. The opportunity came about because I am a reader. 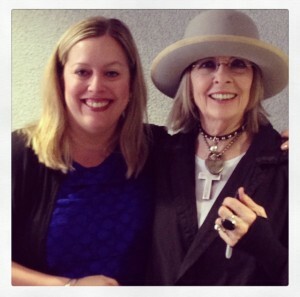 In case you still aren’t sure what benefits you gain from being a reader, here’s one: you can meet Diane Keaton. Just follow your favorite independent bookstore on Facebook or sign up for their emails and you learn about these things. I’ve met Ann Patchett, Jess Walters, Jenny Lawson, Jeannette Walls, Garrison Keillor, and even Grumpy Cat that way. It’s that easy. Diane was as you would expect her to be. Lovely. Quirky. Coy. Smart. Stylish. God, I loved her outfit. She was comfortable in her own skin. So comfortable that just a few minutes into her talk, she took off her ankle booties to reveal bare feet. She was real. She continued her talk barefoot, reading an excerpt from her new book, Let’s Just Say It Wasn’t Pretty, about a wall in her home that houses portraits of famous men. John Wayne, Gary Cooper, Sam Shepard, Tony Ward, to name a few. All “prisoners” on her wall. Interestingly, she shared that former flame Warren Beatty and “wild man” Jack Nicholson were not captive there. No, it was a photo of Warren, post break up, kept in a pocket of her shirt that enabled her to conjure up the grief needed for a scene in The Little Drummer Girl. We laughed. We swooned. And she was done in what seemed a matter of minutes. I don’t think any of of us, all 1,100 of us packed in that auditorium, wanted her to stop talking. But she did. And then we got to meet her.That’s right. 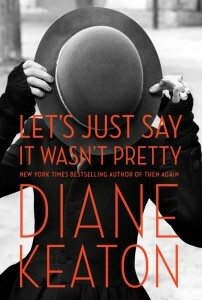 THE DIANE KEATON agreed to meet all of us, sign our books, and take a picture with us. All of us. Unbelievable. I went with four other friends. Three of us were in signing group C. Two of us were in D. And hundreds were in the double-lettered groups. It took us about an hour to make it to the front of the line. There were rules we had to follow. No real cameras. Only camera phones. Flashes off. No pictures while waiting in line. I wanted a picture with her, but one with my friends, too. “I don’t think we can do that,” D said. “But I am the last in line,” I responded. “You are not the last in line; there are 1,000 more people to go.” D reminded me. “Where are we going to go?” C asked. “Okay, I know. Just stay close and after I get mine, I will ask.” I said. Of course! Let’s get one with all of you! If you never ask, the answer will always be no. Find the right time and always ask. Always. This I learned from my father. Not so much by word, but action. See Dad? I have been paying attention. We waited for our other friends, the Group Ds. Once reunited, we squealed and giggled like teenagers. We shared photos, added filters, and posted them to social media and reveled in the moment. Did what just happen really just happen? 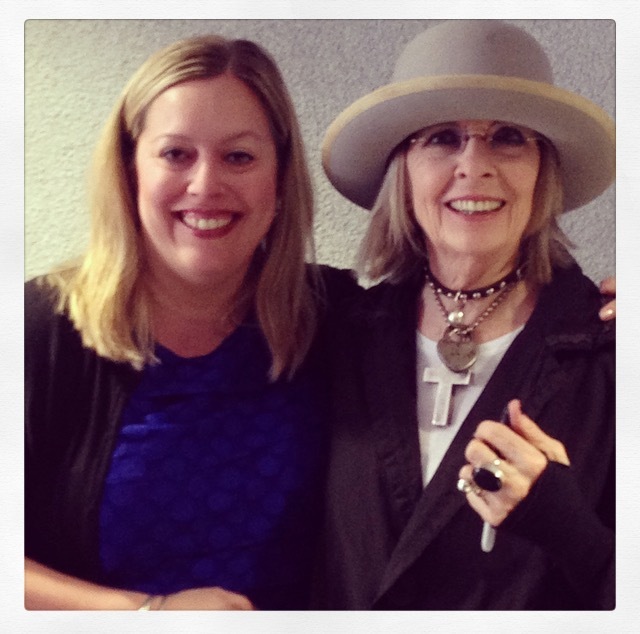 The once in a lifetime moment of meeting Diane Keaton? It did because I am a reader. It did because I asked. In case you are wondering, I am on on the left. Oh, so you’re the one on the left? At first I couldn’t tell. Oh, that’s right. You’re the one who forgot to wear her hat! I need a Diane Keaton hat! Her jewelry was as fab as she was!